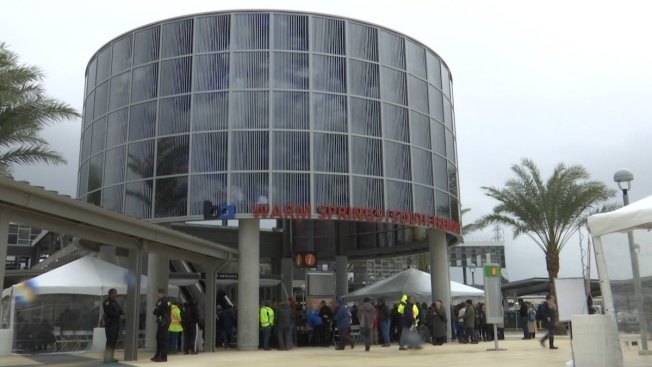 The Warm Springs BART station opened Friday, much to the relief of residents of the city of Fremont who will be able to enjoy a state-of-the-art commuting experience at the regional transit system's newest station. When it came to designing and building the station, architects had blank slate of sorts, compared to previous stations which went up in denser urban neighborhoods. Lead architect Anko Chen with infrastructure solutions firm HNTB designed a station that stretches for two blocks, with a gracefully slanting roof covered in solar panels. The station's centerpiece is a glass rotunda where an escalator that gathers passengers and lifts them into the station. "This building, this station design, is intensely focused on passenger comfort and ease of getting in and out of the station," Chen explained. "We created the rotunda as a point of arrival, but also a plaza space in front of the rotunda. So at peak hour travel, people can flow through the space with ease and confidence." The tall rotunda walls are made of art glass by Catherine Widgery. The piece is entitled "Sky Cycles" and echoes the rolling green hills to the east of the station and other natural features. Chen said he worked so that his structure would complement the artwork and vice versa. The station has been under construction for the past eight years. It was originally supposed to open in June 2014. Incompatible equipment and technology, plus training for station workers, delayed the start of service on the 5.4-mile extension to Warm Springs for almost two years. Fremont commuters, tired of constant congestion on the Nimitz Freeway or leaving home at dawn to get a parking spot at the Fremont or Union City stations, were glad to hear that trains will finally begin running on Saturday, March 25. Chen said he was proud to design the first major civic building in a brand new neighborhood, which will be transformed by the opening of the station. Major development is planned for the surrounding light-industrial zone, including office space, light industry, and 3,000 housing units clustered around the station. Fremont city officials are already calling the area around the Tesla plant "Innovation Center." Chen's work is not done with the rotunda entrance on the east side of the station. There are plans to build a suspension bridge across the railroad tracks, to connect the station with the homes and workplaces on the east side of the station.